The appointment of Admiral Haakon Bruun-Hanssen as Norway’s new defense chief on Friday won broad support from both inside and outside the military. Bruun-Hanssen, who was also promoted from vice-admiral on Friday, is the first national Chief of Defense to come from the Navy since 1994. 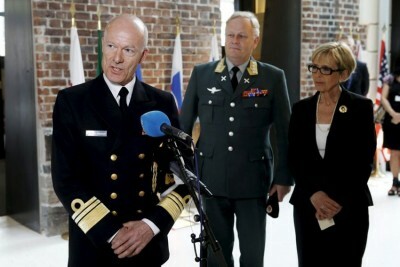 Strøm-Erichsen added that Bruun-Hanssen, age 52, has “an all-round military background and impressive career in the Norwegian Armed Forces.” He graduated from the Norwegian Naval Academy, has studied in the Netherlands and at the Norwegian Defense University College and was appointed vice-admiral in 2011. He most recently has been serving as commander of the National Joint Headquarters near Bodø in northern Norway and earlier has been a submarine captain and chief of the Royal Norwegian Navy. Bruun-Hanssen had been favoured to win the post against four other high-ranking rivals. He’s considered highly qualified for it, with military colleagues calling him an “extremely capable officer” and media commentators calling him “highly respected” at a time when his predecessor has been under criticism over some controversial appointments. Bruun-Hanssen called it “a great honour” to be named defense chief, calling it “a very special job.” He said he planned no great change of course when he takes over from Sunde at the end of the year.